Jeremy Ouedraogo, Minister of Livestock and Fisheries in Burkina Faso, attended a Regional Capacity Development Workshop in Animal Genetic Resources in Sub-Saharan Africa, held in the capital of Ouagadougou, 4 to 6 November, 2013. Sub-Saharan Africa has only a handful of qualified livestock breeders and geneticists. Regional collaboration among scientists and institutions in this area provides rare opportunities to exchange information, pull together resources, network with other professionals, and partner strategic organizations. Addressing more than 75 representatives from 22 sub-Saharan countries before meeting with the UN Secretary General Ban-Ki-Moon on 6 November, Minister Ouedraogo highlighted the need for regional cooperation among individuals and institutions given the region’s scarcity of qualified livestock breeders. He pointed out the urgent need for more appropriate breeding strategies and schemes that will ease access by poor farmers herding livestock in harsh environments to superior livestock germplasm. He thanked ILRI and its partners for supporting Africa’s Global Action Plan on Animal Genetic Resources, which was endorsed by African governments in 2007. The minister referred to collaboration between ILRI and partners that has effectively built investments, programs and capacity in this area. Best practices must be captured for replication and scaling up, he said. 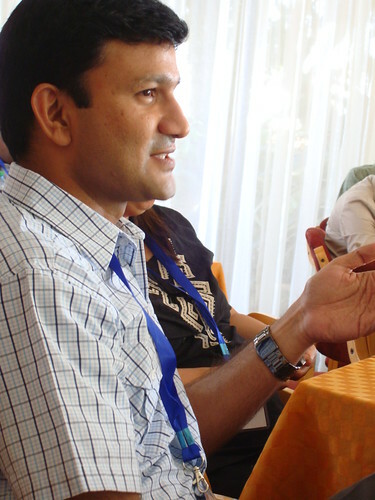 While research should benefit local communities, he said, the scale of the impacts of research depend largely on whether national policies, national budget allocations and national development plans reflect the importance of better use of native livestock resources and allocate funds for developing national capacity in this area. The minister encouraged the workshop participants to engage actively with those developing a second State of the World’s Animal Genetic Resources report, due to be published by the United Nations Food and Agriculture Organization (FAO) in 2014. The workshop was organized by the International Livestock Research Institute (ILRI) and the Swedish University of Agricultural Sciences (SLU). In partnership with FAO, the African Union–Interafrican Bureau for Animal Resources (AU-IBAR) and the Tertiary Education for Agriculture Mechanism for Africa (TEAM-Africa), ILRI and SLU are holding regional back-to-back workshops this November in Burkina Faso, Rwanda and Botswana. The purpose is to strengthen regional platforms boosting knowledge exchange, collaboration and capacity in improved conservation and use of Africa’s animal genetic resources. CGIAR and ILRI have worked together with SLU for a decade to develop capacity in animal genetic resources work. Groups of selected ‘champions’ of this work have been given training in their home institutions by the ILRI/SLU project to advance animal genetic resources teaching in higher education and research work within and outside the university. In an opening address to the workshop, Abdou Fall, ILRI’s country and West Africa’s regional representative, commended the strong representation from 22 countries in the region: from Senegal to Congo and from Benin to Ivory Coast, Guinea Bissau and Niger. This geographic breadth’, Fall said, ‘should help provoke dynamic discussions on better and more sustainable use of Africa’s livestock breeds and genes and the capacity development programs that underpin this. Training has long been a central element in the capacity development approaches ILRI and SLU have taken to strengthen Africa’s use of animal genetic resources; indeed, for many partners and donor organizations, Fall said, this training has been a hallmark of the project’s achievements over the past decade. But Fall highlighted that capacity development work in CGIAR/ILRI goes beyond training and transferring knowledge and skills to individuals, and now embraces work effecting change in organizations, institutions, cultures and sectors. 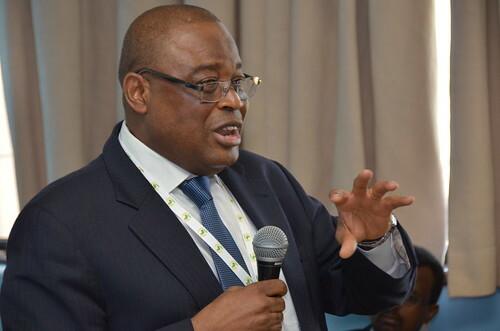 Fall said capacity development activities can serve sustainable use and appropriate management of the continent’s diminishing livestock genetic resources only if they are embedded within broader policies, strategies and frameworks. ILRI takes a systems approach to capacity development, he said, which addresses up front institutional and organizational shortcomings and regulatory and cultural barriers to sustainable development. Individual: The skills, experience, knowledge and motivation of people. Taking such a systems perspective, Fall explained, requires finding the right balance between, on the one hand, responding to expressed demand for agricultural research-based knowledge and interventions, and, on the other, jumping on emerging opportunities and innovations with potential for accelerating agricultural development. This workshop should help AU-IBAR increase its animal genetics work through a 5-year project funded by the European Union and through strengthened collaboration with FAO in this area. Outcomes of the 4-day Burkina Faso workshop — including lessons learned from the past, a prioritized list of new topics/problems for new MSc and PhD students to take on, a list of key messages, and action plans for animal genetic resources work in Western Africa — will help lay the foundations of the West African Platform on Animal Genetic Resources. ILRI is one of 15 CGIAR research centres and 16 multi-centre research programs located around the world and dedicated to reducing poverty and improving food security, health and nutrition, and natural resource management. Like other CGIAR centres, ILRI leads, co-leads or supports cutting-edge research on sustainable agriculture and designs, conducts and monitors in-country research-for-development programs and projects with the aim of producing international public goods at scales that make significant difference in the lives of the world’s poorest populations. ILRI does this work in collaboration with many public and private partners, which combine upstream ‘solution-driven’ research with downstream adaptive science, often in high-potential livestock value chains engaging small- and medium-sized agri-businesses and suppliers. In this work, ILRI and its partners are explicitly supporting work to meet the UN Millennium Development Goals and their successor (now being formulated), the Sustainable Development Goals. ILRI envisions a world where all people have access to enough food and livelihood options to fulfill their potential. ILRI’s mission is to improve food and nutritional security and to reduce poverty in developing countries through research for efficient, safe and sustainable use of livestock, ‘ensuring better lives through livestock’. Diana Brandes-van Dorresteijn is a staff member in ILRI’s Capacity Development Unit. Livestock herding in Niger (photo credit: ILRI/Stevie Mann). Two major recent World Bank agricultural summits in Mauritania and Senegal recently urged African countries and communities in the Sahel and the international development community to help protect and expand pastoralism on behalf of the more than 80 million people living in the Sahel who rely on it as a major source of food and livelihoods. ‘. . . African agriculture employs a massive 65–70 percent of the continent’s labor force and typically accounts for 30–40 percent of GDP. It represents the single most important industry in the region, and therefore its transformation and growth is vital to reduce poverty in a region like The Sahel and avoid humanitarian crises that have all too frequently plague the region’, said Makhtar Diop, World Bank vice president for the Africa Region, who opened the Pastoralism Forum in Nouakchott, the Mauritanian capital, on 29 Oct 2013. 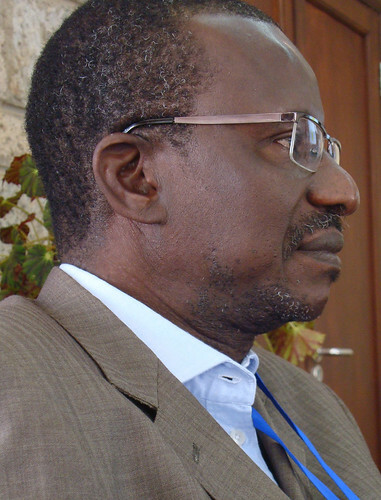 The statement that follow are by John McIntire, deputy director-general—integrated sciences, at the International Livestock Research Institute (ILRI), who gave his thoughts at one of these summits on ‘The future of West African pastoralism’. Read the whole World Bank press release: West Africa: The Sahel—New push to transform agriculture with more support for pastoralism and irrigation, 27 Oct 2013. The interior of a tea room in Chinseu Trading Centre, in Zomba West, Malawi (photo on Flickr by John Appiah-Duffell); the menu on the wall, written in Chichewa, lists the following: PRICES FOR TEA: Tea without milk, Tea with milk; EXTRAS: Buns, Nsima with chicken, Nsima with meat, Nsima with beans, Rice. 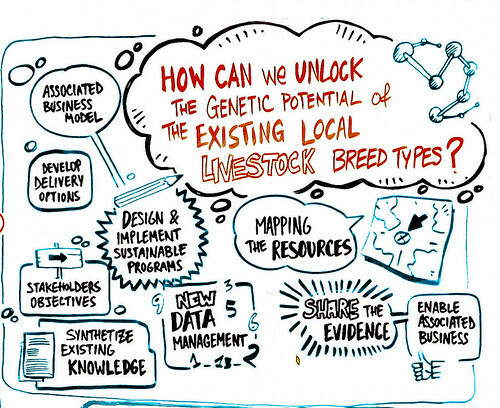 The following is a report on livestock-related presentations at the on-going three-day CGIAR Science Forum, 23–25 Sep 2013, in Bonn, Germany. From yesterday’s session on food safety is this brief from veterinary epidemiologist and food safety expert Delia Grace, of the International Livestock Research Institute (ILRI), on the case for agricultural interventions for food safety. Agriculture has allowed massive expansion of people and their animals. Yet in a world of more than 7 billion people, more than one billion are hungry and more than 2 billion are sickened each year from the food they ate. Agriculture is exacting a heavy biological cost, but health policy and programs often stop at the clinic door. A consensus is growing that the disconnect between agriculture, health and nutrition is at least partly responsible for the disease burden associated with food and farming. 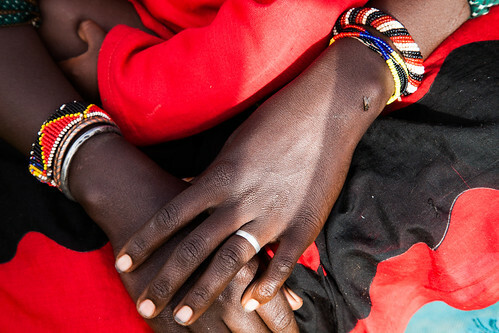 ‘The new CGIAR Research Program on Agriculture for Enhanced Nutrition and Health is attempting to bridge this disconnect and the International Livestock Research Institute (ILRI) leads the component focusing on diseases related to agriculture. This session uses the case of fungal toxins to explore how research can contribute to game-changing innovations, powerful incentives and enabling institutions that improve at the same time food safety, food accessibility for poor consumers and access to markets for smallholder farmers. * Incentives for risk management: In poor countries, where public and private standards are weak and where consumers’ choices are limited by income and information, incentives to safe production are lacking. Novel incentives need to be found to encourage farmers and other value chain actors in poor settings to produce quality and safe products. * Innovations for risk management: Informal markets and food produced and consumed by smallholders typically have high levels of hazards. Innovations, whether technology, social or market-based, can change the game. * Institutions for risk assessment: Food safety regulations in developing countries are characterized by complexity, inappropriateness for informal and smallholder production, lack of translation of policy into practice, and frequent negative impacts of policy. Both evidence and effective influence are needed to improve food safety institutions. 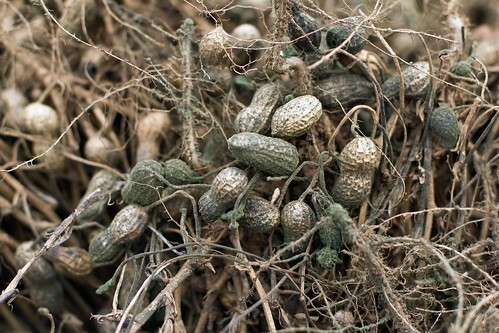 If not stored and dried properly groundnut can get mouldy (photo credit: ICRISAT/Swathi Sridharan). ‘Among staple crops (maize, groundnuts, sorghum), the most serious food safety problem is toxins produced by fungi. These cause around 90,000 cases of liver cancer each year and there are strong associations between aflatoxin exposure and stunting and immune suppression in children. There have also major impacts on trade and the livestock sector. How do initiatives to improve dietary and income outcomes need to be structured to reap benefits of both at present and over time? How can the multi-dimensional nature of the nutrition-income linkage be integrated into investment projects in this area? What are the knowledge gaps in developing and implementing these strategies? 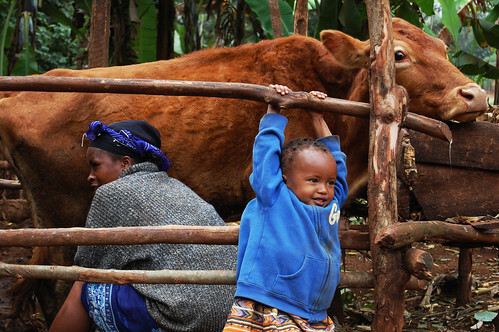 An East African smallholder dairy farmer and her cow and child (photo credit: Jeff Haskins). Tom Randolph, ILRI agricultural economist and director of the CGIAR Research Program on Livestock and Fish, will make a presentation on Supporting the pro-poor transformation of smallholder-based animal-source food systems. Note: This post was developed by ILRI corporate communications writer/editor Paul Karaimu. The second day of the ongoing (15-20 Jul 2013) sixth Africa Agriculture Science Week of the Forum for Agricultural Research in Africa (FARA), in Accra, Ghana, featured conversations on how to develop climate-smart agriculture, how to improve the resilience as well as productivity of Africa’s smallholder farmers and how to make wider use of demonstrable successes in development of the continent’s capacity for agricultural innovation. Although small-scale farmers and herders produce most of the continent’s food, many of them remain beyond the reach of agencies providing essential, up-to-date and locally relevant information on optimal crop and animal husbandry practices. Indeed, a significant gap continues to divide researchers of food production from the farmers who produce the food. Monty Jones, executive director of FARA, speaking at AASW6 (photo credit: ILRI/Paul Karaimu). And then there are the disabling gaps between research disciplines and fields related to agriculture. Lindiwe Majele Sibanda speaking at Africa Agriculture Science Week (photo credit: ILRI/Paul Karaimu). Lindiwe Majele Sibanda, a policy expert and beef farmer from Zimbabwe who is chief executive officer and chief of mission of the Food, Agriculture and Natural Resources Policy Analysis Network (FANRPAN), based in Pretoria, agrees. 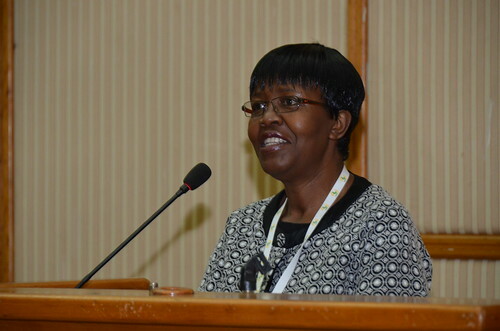 Sibabda, who also serves as chair of the board of trustees of the International Livestock Research Institute (ILRI), also recommends a review of national support to research institutions. FARA’s 6th Africa Agriculture Science Week (AASW6), in Accra, Ghana, included marketplace exhibitions (15–20 Jul 2013), side events on sub-themes (15–16), a ministerial roundtable alongside a Ghana Day (17 Jul), plenary sessions (18–19) and a FARA Business Meeting (20 Jul). 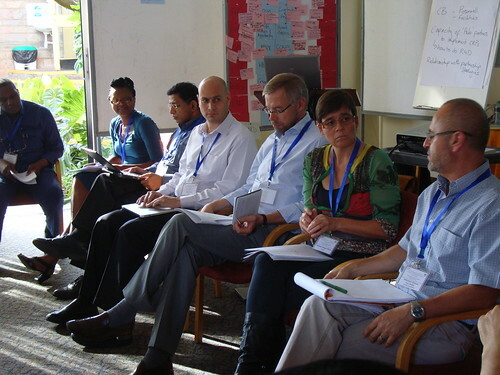 The discussions were captured on Twitter (hashtag #AASW6) and blogged about on the FARA AASW6 blog. Livestock matter to the livelihoods and ambitions of most people living in Africa and other developing regions of the world (image credit: ILRI/Rob O’Meara). Note: This post was developed by ILRI corporate communications staff Paul Karaimu and Muthoni Njiru. The 6th Africa Agriculture Science Week (AASW6) of the Forum for Agricultural Research in Africa (FARA) is being held this week (15–Jul 2013) in Accra, Ghana. The official opening and plenary sessions start tomorrow, Thu 18 Jul. Speaking at Monday’s launch of the whole AASW6 week, Tiemoko Yo, chairperson of FARA, said the science week aimed to respond to some of the burning issues in African agricultural research for development. Many if not most of those issues were discussed in more than 50 side events held over the first 2 days of the week, many of them by CGIAR centres. The session started with a look at Africa’s livestock sector as a whole. 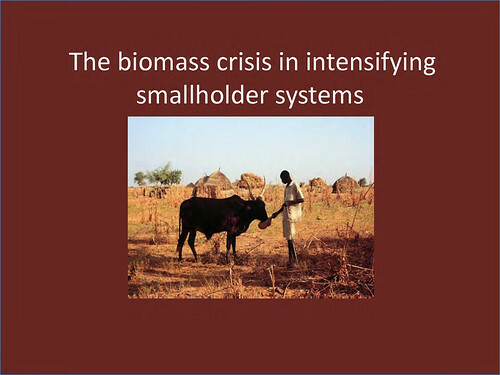 Next was a brief look at an emerging ‘biomass crisis’ in African agriculture. 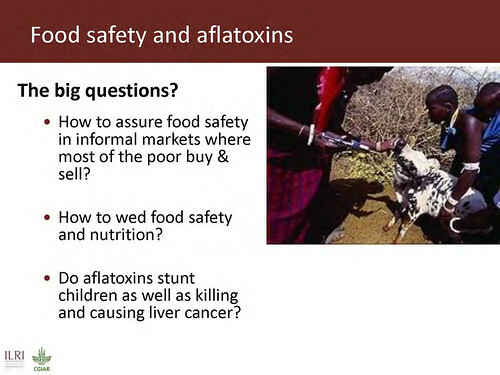 Next up was a quick overview of the public health threats posed by livestock foods and aflatoxins. ‘Ensuring food safety is one of the most important issues facing the agricultural sector today’, said Delia Grace, a veterinary epidemiologist and food safety expert at ILRI. ‘This is especially so in developing countries, where food-borne diseases are among the top five health burdens. Livestock diseases and unsafe milk, meat and eggs pose multiple burdens on the poor. They sicken and kill people and animals and burden national economies with huge economic losses’. Unfortunately, she said, efforts to improve food safety standards can end up hurting the poor, who, finding it difficult to meet those standards, are often cut off from the informal markets they depend on. Livestock foods also pose problems, she said. Next was an introduction to livestock vaccines for African livestock. ILRI scientist Polly Ericksen also spoke on ILRI-partner approaches to new research on pastoral systems in Africa’s drylands and Ethel Makila introduced the state-of-the art facilities and training opportunities in the Biosciences eastern and central Africa-ILRI Hub, endorsed by the New Partnership for Africa’s Development (NEPAD) Comprehensive African Agricultural Development Programme (CAADP) and located in Nairobi, Kenya. ILRI deputy director for research in integrated sciences, John McIntire, provided a synthesis of the morning’s discussions. ‘When a research-based agricultural intervention is introduced to a community,’ said Mkhunjulelwa Ndlovu, of Zimbabwe’s Department of Agricultural, Technical and Extension Services, ‘it must be integrated into existing work and involve other stakeholders in development, especially governments, to ensure that use of the intervention is sustained over the longer term. Group discussions at the ILRI side event on 15 Jul at the 6th Africa Agriculture Science Week (AASW6), in Accra, Ghana, 15-20 Jul 2013, organized by the Forum for Agricultural Research in Africa (FARA) photo credit: ILRI/Ewen Le Borgne). 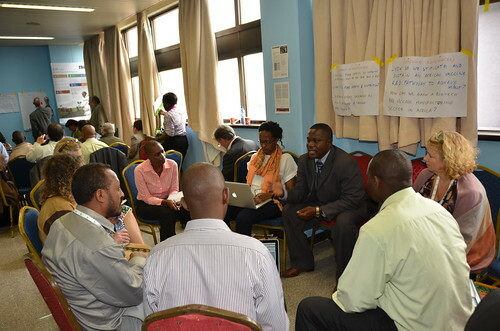 Those participating in this ILRI-hosted side session agreed on the need for livestock scientists to work in multidisciplinary teams and engage in ‘holistic’ research. Only by doing so, they said, would livestock scientists be in position to evaluate all components affecting the livestock sector and thus to help reduce the many risks and burdens faced by Africa’s millions of small-scale livestock producers. The participants also agreed that it is the responsibility of livestock and other agricultural researchers to provide policymakers with evidence of how each component of smallholder farming links to others and how investing in one component can make a difference to the other components. Improving animal health, for example, can also improve the safety and nutritional value of animal-source foods. Recommendations put forward at ILRI’s side meeting for enhancing the livestock sector’s contributions to Africa’s food security and poverty reduction include the following. Ensure development of high-quality vaccines is supported by high-quality vaccination campaigns that involve local communities. Incorporate indigenous knowledge to ensure research understands community realities and addresses community needs. 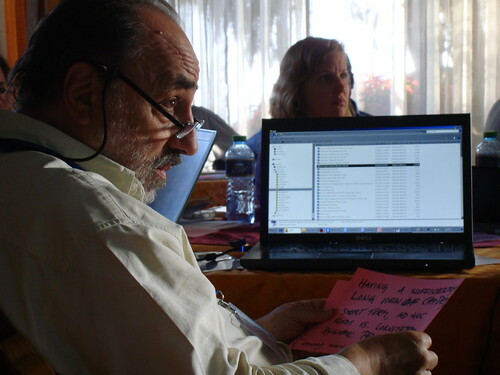 Boost the essential roles of continental and sub-regional approaches to development in the livestock research agendas. FARA’s 6th Africa Agriculture Science Week (AASW6), in Accra, Ghana, includes marketplace exhibitions (15–20 Jul 2013), side events on sub-themes (15–16), a ministerial roundtable alongside a Ghana Day (17 Jul), plenary sessions (18–19) and a FARA Business Meeting (20 Jul). Follow the discussions on Twitter with the hashtag #AASW6 or visit the FARA AASW6 blog. 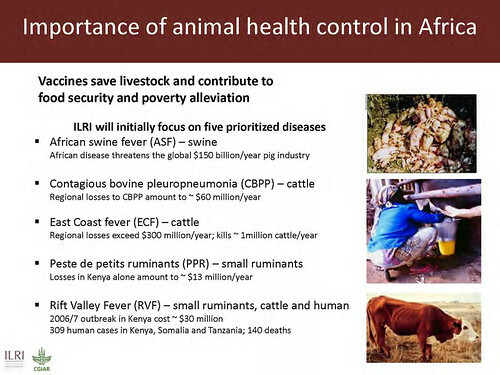 View all of the ILRI slide presentations: Livestock research for food security and poverty reduction, 15 Jul 2013. 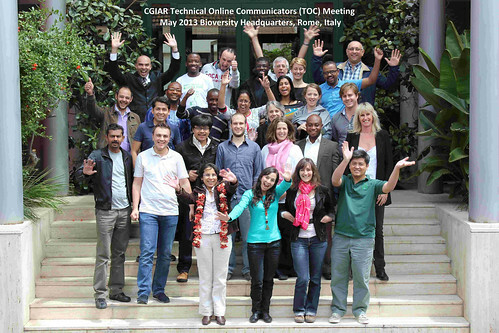 Group picture of the participants, resource experts and facilitator (Peter Casier, middle of back row, both hands raised) of the first CGIAR Technical Online Communicators Workshop, 27–31 May 2013, Rome. Twenty-four technical online communicators (aka ‘web geeks’), representing 12 of the 15 centres of the CGIAR Consortium and 5 CGIAR partner organizations, along with a dozen or so experts in various technical web-related matters, recently participated in a five-day workshop at Bioversity International, a CGIAR centre based in Maccarese, outside Rome. This was the first such meeting of CGIAR (and partner organization) staff who, just a few years ago, would probably have been called ‘webmasters’, in the sense of technicians who design or maintain websites. That designation has changed, however, splintering into dozens of specialities in recent years with the on-going explosion of social media and other online tools, vehicles and platforms. So ours was a motley group of people serving variously (and singly or in combinations) as ‘web developers’, ‘web designers’ or ‘web [or server] administrators’; as ‘social media coordinators’ or ‘content managers’; as ‘knowledge sharers’ or ‘workflow coordinators’. Some were more on the IT side, some more focused on user engagement; some were most interested in ensuring security, some in ensuring open access; some started as content designers, some as content writers; some are now specializing in web analytics, some in social learning. Interestingly, fully a third of the group still work mostly on originating online content (content still king? ), while others now focus on ‘spinning’ the content through various social media channels (a task becoming a job on its own). The online ecosystems in these agricultural research-for-development organizations are thus evolving rapidly. And the byzantine complexity of online expertise, staffing, monikors and structures in CGIAR centres is mirrorred in many other organizations today, some of which are now forming cross-cutting web management teams headed by ‘chief web officers’ operating at the level of chief information officers. What’s clear is the increasing need for better online strategies and coordination to further organizational communications, goals and missions. With CGIAR’s fast-growing online presence, the people who ‘pull the online levers’ should no longer, this group believes, labour in isolation but rather have spaces in which to share their trials, tribulations and successes in revamping websites, optimizing websites for search engines, making web infrastructure more secure, and so on (and on). What the workshop also made clear is that ‘geeky’ (we have agreed among us that this term, rather than ‘nerdy’, best reflects the group’s persona*), while accurately depicting what might appear as odd or unconventional, as well as technically obsessed, behaviour (and worn as a matter of pride, I suspect, by this group), denotes neither social awkwardness nor social inferiority. The socializing among the group was intense—with the younger participants running a lively online digital conversation in parallel with the ‘real’ conversation in the workshop room every day, and with the online reporting as we went along instantly appearing seemingly everywhere on the web. And every evening almost everyone took the train into Rome—to consume its food, wine, street life, handicrafts, imperial antiquity—till midnight. And then managed the early train the next morning to Maccarese and the workshop. Unstoppable! Further demonstrations of the cultural/humanistic dispositions of these technical enthusiasts came in the course of the week in the form of spontaneous opera singing, a virtuoso violin performance, a love of fine typography, a passion for truffle cream, impromptu dancing and singing contests, and much more. Links to 180 resources for online work mentioned or discussed in this workshop are posted on Delicious. For more information, follow the hashtag #TOCS2013 on Twitter and Yammer and read the posts on blogs by Marina Cherbonnier and Codrin Paveliuc-Olariu, both of Young Professionals in Agricultural Research for Development (YPARD). For a digital conversation running side by side with the physical conversation of the workshop, see the Twitter stream collected by Codrin Paveliuc-Olariu. Or contact Peter Casier at p.casier [at] cgiar.org (check out his ‘home page’, My House on the Road; his The Road to the Horizon blog; his Blog Tips blog; his Humanitarian and several other news aggregators . . .). The word geek is older [than nerd], starting out in the early 1900s to refer to a carnival performer whose only skill was the ability to bite the heads off chickens.’ — BBC News: Are ‘geek’ and ‘nerd’ now positive terms? 16 Nov 2012. 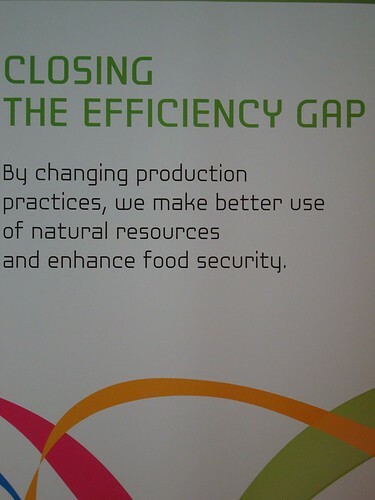 One of three objectives of the Global Agenda of Action in Support of Sustainable Livestock Sector Development. Its Third Multi-Stakeholder Platform Meeting was co-hosted in Nairobi, Kenya, by ILRI, FAO and AU-IBAR, 22-24 Jan 2013 (photo credit: ILRI/Susan MacMillan). 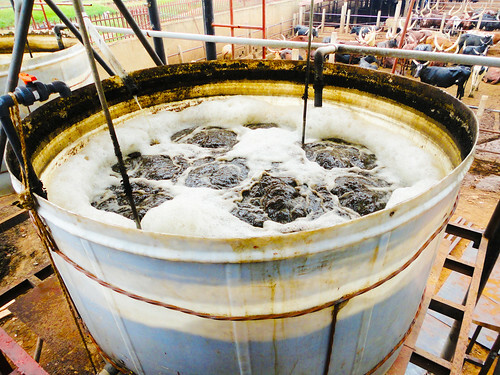 In collaboration with the Food and Agricultural Organization of the United Nations (FAO) and the Kenya Ministry of Livestock Development, researchers at the International Livestock Research Institute (ILRI) are assessing the feasibility of the Kenyan dairy industry obtaining payment for its environmental services through productivity gains. (See this ILRI position paper for more information on ‘payment for environmental services’ schemes). Reducing the level of greenhouse gases generated per unit of milk produced by smallholder farmers could be attractive to environmental markets. While this project will not provide direct money transfers to Kenya’s dairy farmers, it will support agricultural extension for better cow nutrition and other interventions made to increase milk production while also reducing emissions of greenhouse gases per unit of milk. The concept gained momentum at an interim preparatory committee meeting of the Global Agenda of Action in Support of Sustainable Livestock Sector Development held in Rome in September 2012. The Global Agenda is committed to broad-based, voluntary and informal stakeholder actions improving the performance of the livestock sector. It ambitiously aims to protect natural resources as well as to reduce poverty and protect public health. The Agenda’s stakeholders have agreed initially to focus on the following three objectives: Close the efficiency gap in livestock production systems, restore value to grasslands’ environmental services and sustainable livelihoods, and recover and recycle nutrients and energy contained in animal manure. The Agenda is working to achieve these objectives largely through consulting and networking, analyzing and informing, and guiding and piloting. 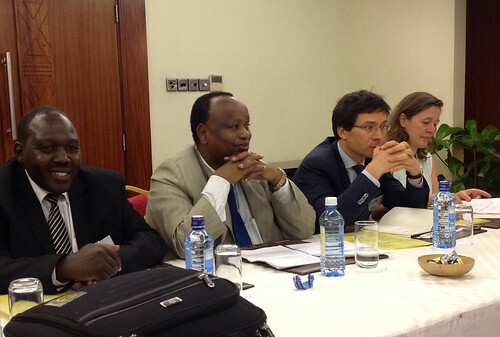 Progress on the Kenya dairy pilot ‘payment for environmental services’ project was presented at the third multi-stakeholder platform meeting of the Global Agenda, held in Nairobi, Kenya, 22–24 January 2013. This project provided a practical example of the Agenda’s core activity in piloting novel approaches to ‘close the efficiency gap’. The presentation to the Global Agenda meeting can be found on its Livestock Dialogue website. A stakeholders’ workshop on a pilot ‘payment for environmental services’ project for Kenya’s dairy industry was held in Jan 2013. Pictured left to right: Luke Kessei, Kenya Ministry of Livestock Development; Julius Kiptarus, Director of Livestock Production in Kenya’s Ministry of Livestock Development; Pierre Gerber, Food and Agriculture Organization of the United Nations; and Isabelle Baltenweck, ILRI (photo credit: MLD/Henry Ngeno). Following the progress update provided at the mid-January 2013 Global Agenda meeting, a stakeholder workshop was held later in the month (29 Jan 2013) engaging representatives from the Kenya Dairy Board, the Kenya Agricultural Research Institute, the Kenya Dairy Processors Association, Kenyan livestock and cooperation ministries, development organizations and ILRI. The workshop was attended by Julius Kiptarus, Director of Livestock Production in Kenya’s Ministry of Livestock Development. Stakeholders of the pilot ‘payment for environmental services’ project for Kenya’s dairy industry discussed the intricacies of such schemes, particularly carbon markets; site selection; potential greenhouse gas mitigation activities; and the design of a feasibility study. View slide presentations from this workshop here. Generating carbon credits from the Kenyan dairy industry: A pilot study from ILRI: By Simon Fraval, ILRI. Feasibility assessment of selected sites for the pilot project on the feasibility of generating carbon credit through dairy productivity gains from ILRI: By Isabelle Baltenweck, ILRI. Technical mitigation options in dairy from ILRI: By Caroline Opiyo, of FAO. This pilot project is the first to access markets for payment for environmental services schemes through productivity gains in smallholder livestock enterprises. With the setting of this precedent and development of an internationally recognized methodology, development organizations will be able to replicate this pilot project and draw funding from the carbon market and other providers of ‘payment for environmental services’ schemes. This communiqué was developed by participants of a High-Level Consultation for a Global Livestock Agenda to 2020, co-hosted by the World Bank and the International Livestock Research Institute (ILRI) in Nairobi, Kenya, 12–13 Mar 2012. At that meeting, leaders in livestock development issues exchanged ideas, concerns, experiences and expertise with the aim of developing closer partnerships, a shared vision and more complementary programs for a global livestock agenda. They agreed on the outlines of a consensus regarding strategies for a safer, fairer and more sustainable global livestock agenda to 2020. The full joint communiqué follows. In the face of a fast-growing, resource-hungry and commonly misunderstood livestock sector, it is clear that increased investment in the sector is essential to livelihoods, global health and the environment. To address livestock as a global public good, a strengthened alliance has been formed among key institutions charged with shaping and steering the global livestock agenda. We, the representatives of global and regional institutions whose mandates cover livestock, met in Nairobi, Kenya, 12-13 March 2012. We exchanged ideas, concerns, experiences and expertise with the aim of developing closer partnerships, a shared vision and more complementary programs for a global livestock agenda. Our consultation came at an opportune time. Global production and consumption of meat, milk and eggs are growing fast, especially in developing countries, in the face of diminishing natural resources. Decision-makers and investors continue to under-appreciate the critical role that livestock play in the lives and livelihoods of the world’s poorest people. The world remains alert to the risk of pandemics arising at the interface between people and animals. We agreed that social equity, global health and the environment should be considered among the strategic ‘pillars’ of the global livestock agenda. There was also much concurrence on the issues and challenges facing the livestock sector and the ways to address them. We are building this alliance to work in closer partnerships, with each organization bringing to bear its comparative advantage. Together we aim to be more effective in explaining to the world better why livestock are essential to the society and to the health and wellbeing of the poor and to show leadership in addressing the challenges and opportunities that livestock can bring. We will do this by marshalling the best evidence to support our case; directly addressing the harm as well as benefits generated by livestock; learning from successes and failures to design and implement the most appropriate programs and policies; exploiting advances in our understanding of complex systems and powerful new technologies; and building on existing successful initiatives. We aim to develop strategic goals, and to create, and share publicly, a means to measure progress against these goals. We invite our colleagues in other institutions, public and private, to join us. 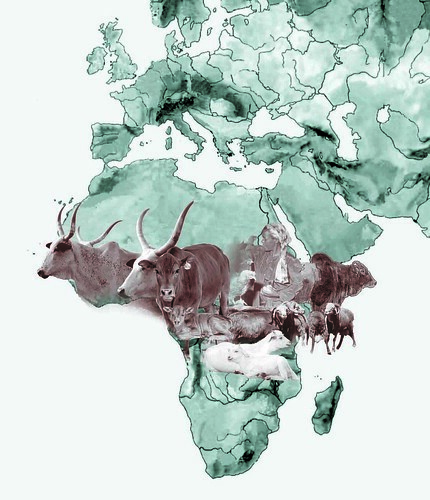 View and download the official version of the communiqué, with logos of the organizations of its eight authors: A new global alliance for a safer, fairer and more sustainable livestock sector, 11 April 2011. Developing an enabling global livestock agenda for our lives, health and lands, 13 Mar 2012. 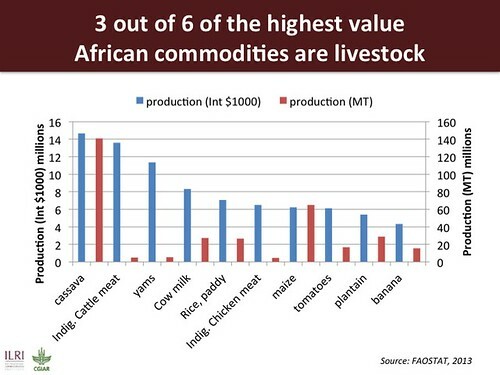 Towards a more coherent narrative for the global livestock sector, 15 Mar 2012. Sharing the space: Seven livestock leaders speak out on a global agenda, 20 Mar 2012.